Ministers like greeters, lectors, extraordinary ministers, altar servers, and choir members truly help us enhance the Mass. As a minister, you can help others partake in a more fulfilling worship experience. Below are the Mass Ministry opportunities available at St. John's. Hospitality and welcoming those into the parish is one of the we best gifts we can give someone. Greeters/Ushers are one of the first faces of St. John’s as people arrive for Mass. This ministry of Hospitality serves to help all people feel welcome and comfortable at St. John’s during the Saturday Evening 6:30 pm Mass, Sunday 8 am, 10 am and 7 pm Mass. This ministry also helps with Mass collections, passing out bulletins and parking passes after Mass and generally serving the needs of our parishioners and guests on any given Saturday Evening or Sunday. Note: 7 pm Young Adult Mass Greeters/Ushers reserved for Young Adults of the community. EMHC’s serve with Father to distribute the most precious Body and Blood of Jesus to the faithful. EMHC’s also can be trained to take communion to the home bound, hospitalized and those in nursing home care. For training information contact Dyan Huey, EMHC Trainer. Note: 7 pm Young Adult Mass EMHC reserved for Young Adults of the community. Lectors/Readers are an essential ministry for the Mass as they proclaim the Old and New Testament Readings during the Liturgy of the Word during the Saturday Evening 6:30 pm Mass, Sunday 8 am, 10 am and 7 pm Mass. They also process into the Mass with the Gospel book and read the petitions or prayers of the faithful. For training information contact Carmie Klein, Lector Trainer. Note: 7 pm Young Adult Mass Lector/Reader reserved for Young Adults of the community. Servers are trained to serve the Holy Mass during the Saturday Evening 6:30 pm Mass, Sunday 8 am, 10 am and 7 pm Mass. This ministry is highly recommended for those who have received their first communion, teenagers and young adult males. Servers set up for the Mass, serve during the Mass and clean up the sanctuary after the Mass. Note: 7 pm Young Adult Mass Servers reserved for Young Adults of the community. Choir members and cantors provide sacred music for the Sunday 10 am (Traditional Choir) and 7 pm (Young Adult Choir) Masses. 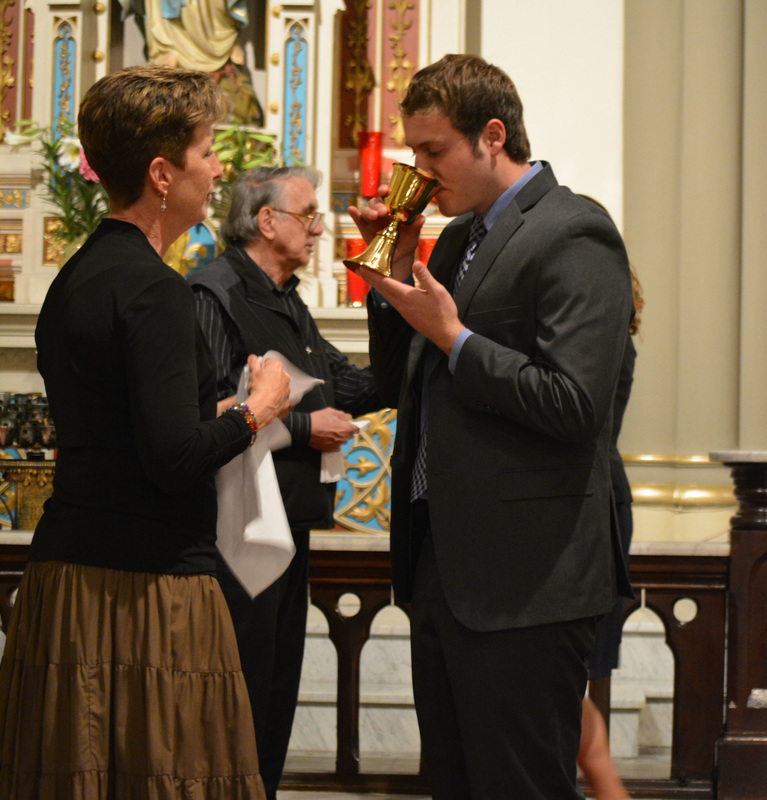 Cantors are also needed for the 6:30 pm Saturday and 8 am Sunday Masses. The two choirs join together for Holy Days of Obligation, Christmas, Holy Week and Easter. For more information contact: Francisco Carbonell, Director of Music. Note: 7 pm Young Adult Mass Choir and Cantors reserved for Young Adults of the community. Parishioners are trained to give “tours” of St. John’s Church sharing not only the history but also the living, growing faith. Tours are given after Colts games, during special events at the convention center such as National Catholic Youth Conference and after Masses on occasion. The training guide helps one study up on the facts as well as the symbolism and meaning of all the physical entities in the sacred space of the Church.